Since computer animation became the kind of thing that could be done in the home, and spurred on by the BBC's animation of 'The Invasion' missing episodes, lots of Doctor Who fans have had a go at reconstructing missing episodes themselves. Marrying up images with the existing soundtracks, some use the telesnaps - John Cura's photographs of the TV screen when the episodes were broadcast; others go down the CG route and create their own versions, with varying results. This, though, is the best of the lot. While there are some stunning Dalek CGI videos, this is the only one containing a human that's managed to capture a fraction of the personality and movement of the actor involved. Haven't posted one of my monsters for a while, so here's one I worked on this Sunday. 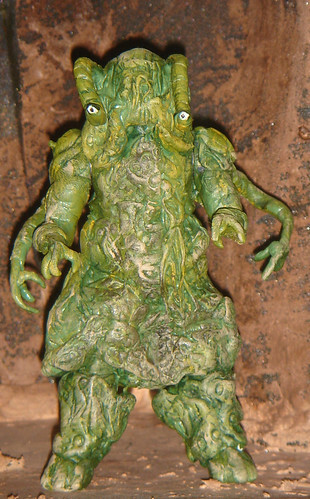 I've been thinking about monsters that are less likely to be materialising as Character action figures, and I reckon this one, which only has a screen time of less than two minutes, must be pretty way down the list. I had to cheat a bit, as the original really doesn't have enough detail to the main body, so I added extra detail, but I think it's fairly faithful to how it looked in episode five. Mr Smith - We Need You! When I was a lad, we had Doctor Who books - novelisations of the TV adventures, written for young teenagers. But there were also a few stories rewritten for a younger age group under the banner 'Junior Doctor Who'. 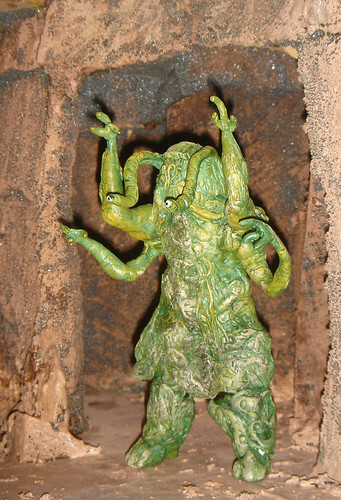 That was how I first experienced the good Time Lord's battle against the Brain of Morbius and the Giant Robot. And that was my first thought when I saw who's been cast as the replacement for David Tennant. At last - it's Junior Doctor Who! Doctor Who fans have never allowed change to stop them from frothing at the mouth at the slightest new idea. So you can imagine what they've been like this weekend. The online forums have gone into meltdown, all because the new Doctor hasn't given them the opportunity to be swept along in a liberal haze by the casting of the first non-white Doctor. Instead, he's white, skinny and 26 years old. "I WANTED PATERSON JOSPEH - THEY'VE MISSED A TRICK THERE!!!" Some online fans love to act as if their thoughts are the only valid ones, and that anyone who doesn't agree with them has 'missed a trick'. They also love to pretend that every single surprising thing is 'obvious'. So the casting of a man nearly 12 years younger than his predecessor is seen as both 'obvious' (because it taps into that Emo trend that's running amok elsewhere) and yet also reckless (because it'll make the show 'too CBBC'). It's hardly an obvious choice though, is it? No-one - not one tabloid hack - suggested him as a possibility. At least, not until Lizo from Newsround slipped it into his report the morning of the announcement. And if The Sarah Jane Adventures are anything to go by, 'too CBBC' would be seen as a criticism by only the most closed-minded, soulless of people. Okay, that's a cheap shot. But then so are so many of Lawrence's posts over there. Then there are those who will say 'I've never heard of him' as if that counts for something. You only have to look at the top wishlists of many online fans to see that they tend to only know actors who've already been in other 'genre' programmes. Would anyone have been seriously touting Chiwitel Eijofor for the part if he hadn't been in Lost? Okay, I admit it - I have no idea what he's been in. Never seen him in anything. I'm told he's good though. Course, there'll also be some who 'always knew he'd be great' as they've 'been fans of his for years'. They could possibly get away with such instant fandom with Eccleston or Tennant, but it's a bit harder to convincingly pull off with someone who has less than ten screen roles to his credit. And that's my favourite bit about this casting - Matt Smith is someone who carries no preconceptions. He can create his character from scratch and surprise us all. David Tennant has wrong-footed so many old-school fans by becoming something no-one else thought was possible - he's bigger than Tom Baker. And how did they solve the problem of the lead actor being bigger than the show last time? They surprised everyone by casting the youngest ever actor to play the part. By the time young Matt Smith steps onto the set, he'll be just two years younger than Peter Davison was when he took on the role. I have to wonder though if the fans would have been quite so vocal if the 26-year-old had been black, though. Could it be that in trying to show off how open-minded they were, some fans have betrayed just how tokenist and patronising they were willing to be? Are there really that many people who think Paterson Joseph is the best black actor of his generation? Whereas do enough of them have enough knowledge of his work to say for certain that Matt Smith isn't a good enough actor to make this work? At least they'll be able to spell Matt's name. Not even Davison could bank on that.